Just Jingle: No Monkey Business Here! That's right! Okay, so it's not even close to right. There is pretty much ALWAYS monkey business around here! HA! BUT...that means there is all the more reason to have created this super fun Monkey Business card! I used the Tropic Topic and the Alphabet Soup sets from The Alley Way Stamps to create this one and it is just too much fun! I created the tree by stamping the segments of the trunk individually and then cutting out the entire thing at once. I stamped some leaves directly on the card, colored them, and then paper pieced several more and added them with foam tape for some dimension. The coconuts are also added with foam tape, as is the monkey! For some more super cute The Alley Way inspiration, be sure to check out the blog today! This is too cute! Love your little monkey. 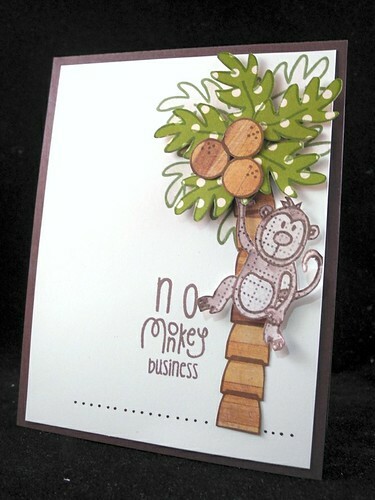 Funny little card, and I love the palm tree. Yep, always monkey business here too. It's the best kind of business :) Love all the cool paper piecing! 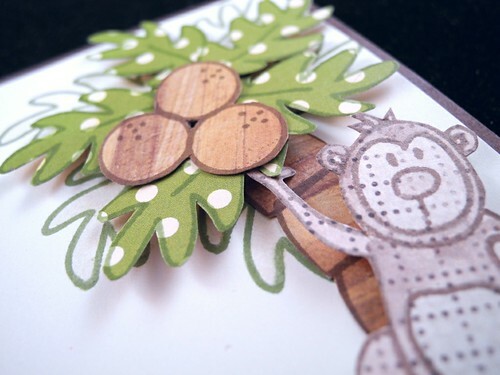 that monkey is TOTALLY cute--GREAT card!